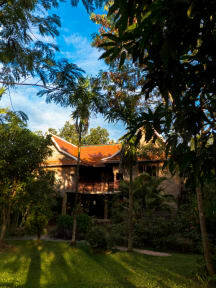 Ganesha Kampot, Eco Guesthouse and more is truly a place like no other. Off of the beaten track, your unique experience starts upon transit to Ganesha, taking a ride through the breathtaking scenery; the rice paddies and the beautiful Bokor Mountain. We welcome travellers who seek to immerse themselves in the culture and feel of Cambodia, families escaping the hustle and bustle of the city, and couples searching for a beautiful romantic retreat. Ganesha Kampot, Eco Guesthouse and more is the perfect serene location for yoga, meditation, photography, reading and relaxing. Take a lazy boat ride down the river or drift along in our traditional Khmer canoe. Our prices are reflective of our varied accommodation, ranging from $8 to $54 per night. Our restaurant offers both local Khmer cuisine, and Western dishes, all lovingly and expertly prepared by our amazing kitchen staff. Free Wifi is available, as is use of our trusty bicycles to explore the surroundings at your own leisure. We can easily arrange transport to and from Kampot town, via tuktuk or motodup. We are also able to book transport to any major cities, including Phnom Penh, Siem Reap, Sihanoukville and Ho Chi Minh. Each room is supplied with a mosquito net, fan, towel, and bed linen at no extra cost.